These web design freebies set creative people free to create. At Greedeals.com, our mission is to partner with the best publishers of anything to do with the Web. So much of web design is repetition. How many drop-down menus does the average web developer create in a working life? How many status indicators? Theyâ€™re essential, but that doesnâ€™t make doing them fun. Itâ€™s reinventing the wheel â€“ you did it before, many times, and now youâ€™re repeating it. 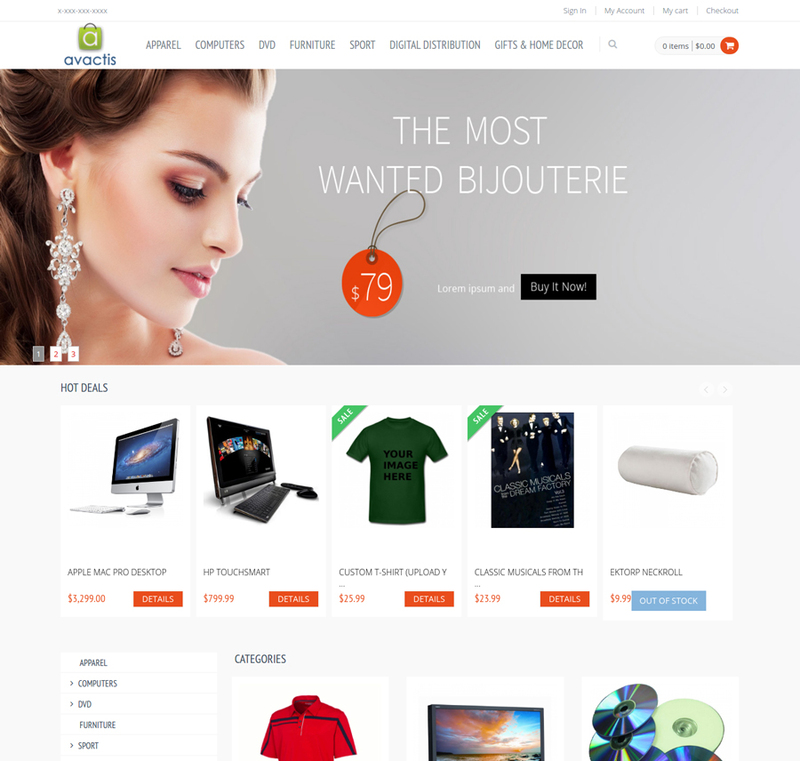 What you want is one organization that brings together from all over the world the very best web design tools. What you want is Greedeals.com. We have some first class paid deals to offer. We also have some remarkable freebies. 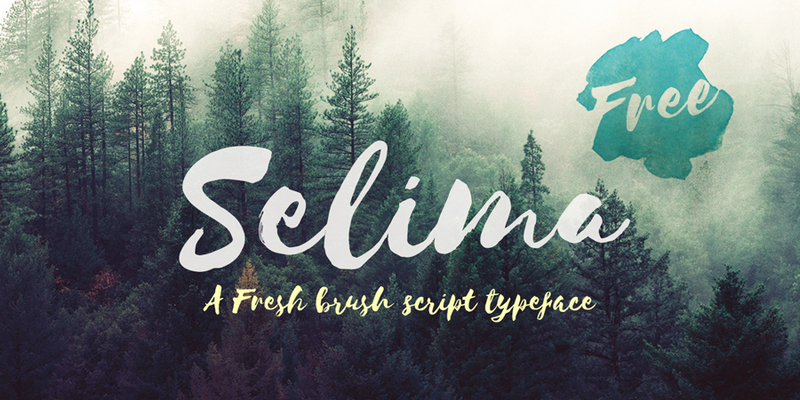 Selima comes in .otf and .ttf formats. Itâ€™s just a great font for websites, flyers, ad campaigns and anywhere where you want something that looks as though the house artist took a brush to it. Lovely irregular baseline and shapes get the message across to even the most jaded visitor. When you want something different enough to stand out really, take a look at Selima. E-Commerce does not work without a shopping cart. Huge amounts of design work go into the product pages. Usually, the shopping cart gets much less attention. And yet a shopping cart can make your company a top performer â€“ or it can break you. Donâ€™t let it happen to you. There are good open source PHP shopping carts out there, and this is one of the best. As design freebies go, itâ€™s a winner. Itâ€™s SEO-friendly and so flexible that it doesnâ€™t matter what youâ€™re selling, your goods will fit and look good. A Top UI Kit â€“ Free! More free design resources for you. This is the stuff every website needs. But developing it takes time. How many drop-down menus will the average web designer produce in a working life? How many progress bars? How many buttons, sign-up forms, and pricing tables? You have to have them â€“ but they take so much time to code. So, donâ€™t code them! 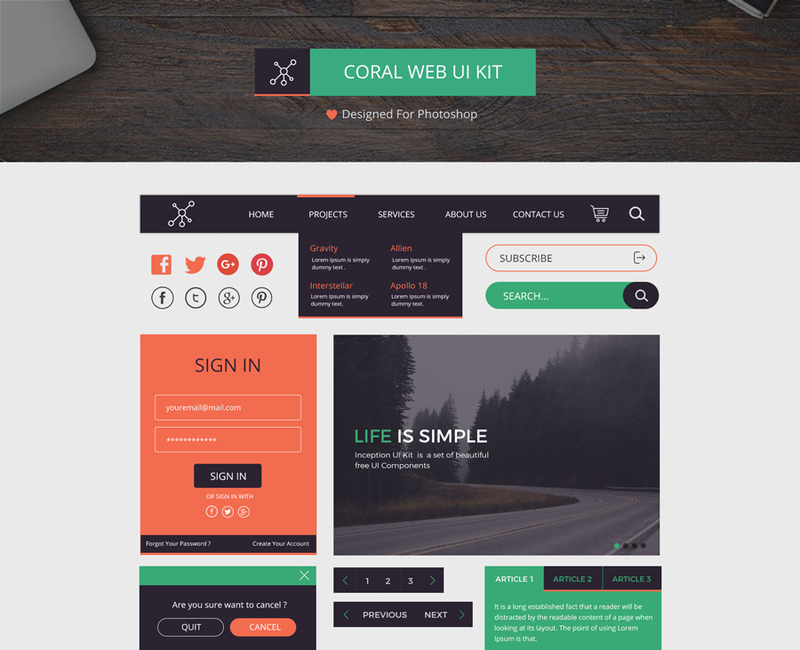 Download our free Coral Web UI Kit, and the code is all there. All you have to do is configure it the way you want it. Use it for your projects or for design work youâ€™re doing for customers â€“ itâ€™s still free. These design freebies are for anyone in the fitness field. Icons tell potential customers at a glance that you (or the customers you design for) have a gym, sell fitness products, or are otherwise engaged in the fitness industry. Use them on a website or a blog, put them on brochures and flyers â€“ or how about a nice T-shirt range? What matters is that you donâ€™t need to start from scratch to develop the right icons. Itâ€™s already been done for you! And, if you develop websites for other people, how watertight is the contract you sign with the customer? (You do sign a contract with the customer. Donâ€™t you?) If youâ€™re not a lawyer, getting these documents right can be a pain â€“ but not if you download this freebie set of legal documents, drawn up by professionals. In this desperately competitive world, finding a way to stand out from the crowd is ever more challenging. 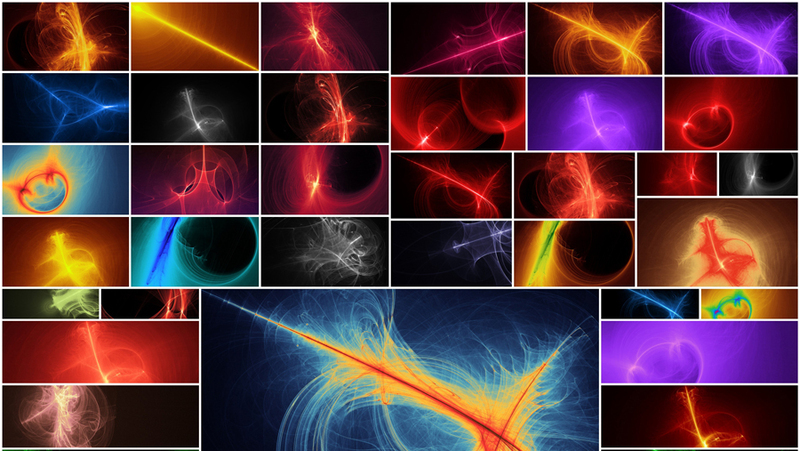 Fractals are one way â€“ you can use them as backgrounds, for buttons, and to highlight certain parts of the site. In fact, the range of uses is limited only by your imagination. What you need, though, is a ready supply of really different fractals (because how will they stand out if they all look much the same?) Download these 57 web design freebies, and youâ€™ll never have that problem again. Valentineâ€™s Day will come again! Every year, on 15th February, thereâ€™s a sigh of relief. Valentineâ€™s Day has come and gone. Yes, it has â€“ but only for another 364 days! And youâ€™re a marketer, so you know you donâ€™t start planning a marketing campaign the week before it goes live. Not if you want to succeed, you donâ€™t. It may only be June now, but youâ€™ll be thinking about those Valentineâ€™s Day campaigns before you know it â€“ maybe before youâ€™ve even got Christmas out of the way. This time, be prepared! 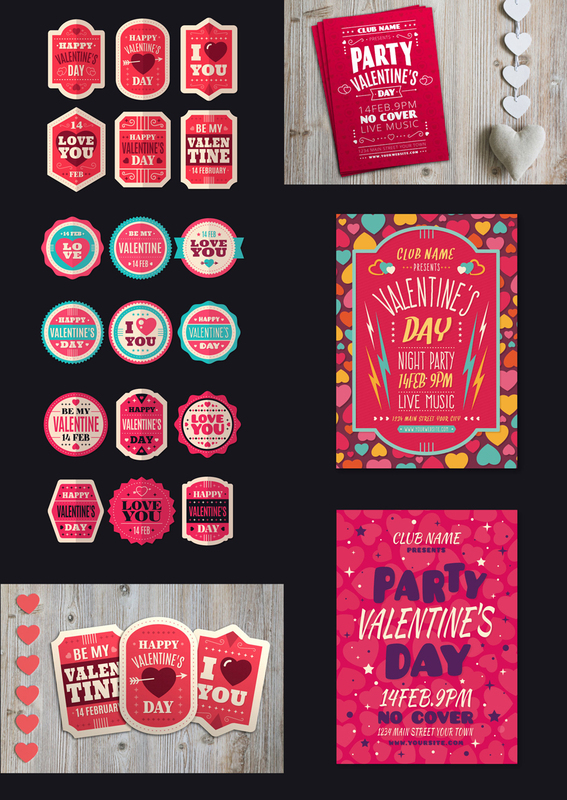 Download these design freebies and give yourself a head start. Youâ€™ll still need to do the creative campaign planning â€“ thatâ€™s your job â€“ but at least you wonâ€™t need to spend time knocking up labels. Or icons. Or posters. Itâ€™s all been done for you! Icons. Oh, boy. Icons make great design freebies. Why? Because everyone needs them. Hereâ€™s a fabulous selection. Theyâ€™re in AI and EPS format; how you scale and color them and what line weight you use is entirely up to you. Thatâ€™s what our web design freebies do; they take the groundwork off your hands and leave you free to modify and create. What makes a coffee shop, a cafe or a restaurant successful? Most of us have our favorite places that we go to regularly. Everywhere in America, from New York to the smallest town, has them. From time to time, other coffee shops and eating places open. We may try them. Sometimes, we only go in once and donâ€™t go back. Occasionally, the new place gets onto our list of regular calls, and we go back again and again. But what attracts us in the first place? And what keeps us going back? Well, thereâ€™s no question that this is a very competitive business to be in. You can tell a successful coffee shop because, when you go into it, you feel the buzz. You see people, sitting in groups and talking, or alone and using the free Wi-Fi. Success in this business is one of those things that, when you see it, you know it. What the owner has to do is to let people know the place is there. In 2017, you do that online. You need the best possible website you can have. The best website you can afford. So: suppose you can get the best possible website for a copy shop, cafe or restaurant â€“ free? Thatâ€™s got to be a winner. Yes? Well, here it is. 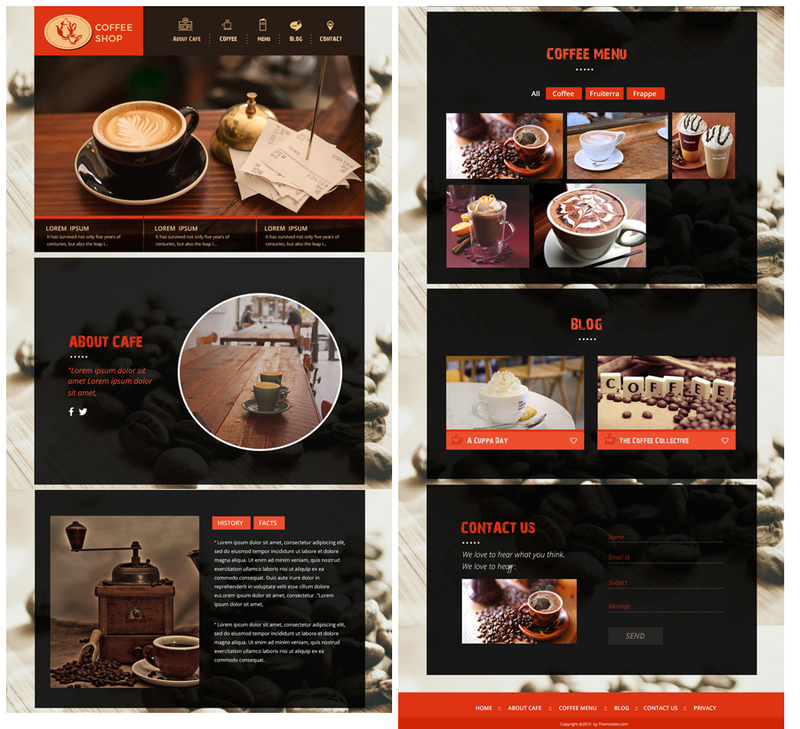 This template is called â€œCoffee Shop,â€� and itâ€™s for any eating place. On the other hand, you donâ€™t want to look like the joint down the road. So, Coffee Shop is fully customizable. Itâ€™s also responsive. If someone is googling on a mobile device, looking for a place like yours, your website will look just great on their tablet or smartphone. To help that along, SEO is at the center of this template. This world we live in is constantly changing. What worked last year may still work this year, but chances are itâ€™s lost some of its edges to something newer. Because you know the importance of branding, you have a logo. Your logo is your brand. It tells people what you stand for. What they can rely on you for. A glance at a well-designed logo is all people need to recognize your brand. And, a couple of years ago, that would have been enough. It isnâ€™t enough today. Logos are still important. You still need a logo. But there are some things that logos donâ€™t do well enough. For this stuff, you need a mascot. A logo is your brand; a mascot is you. Itâ€™s like a person, sitting there on your website and speaking to you. Well, okay. But how do you get a mascot? Hereâ€™s how: download this kit and youâ€™ll find that building your logo the way you want it is easier than you thought. The kit has a whole bunch of accessories. Eleven sets of eyes. Nine mouths. Some gestures. Hard hats, flipcharts, telephones, signposts â€“ you name it. 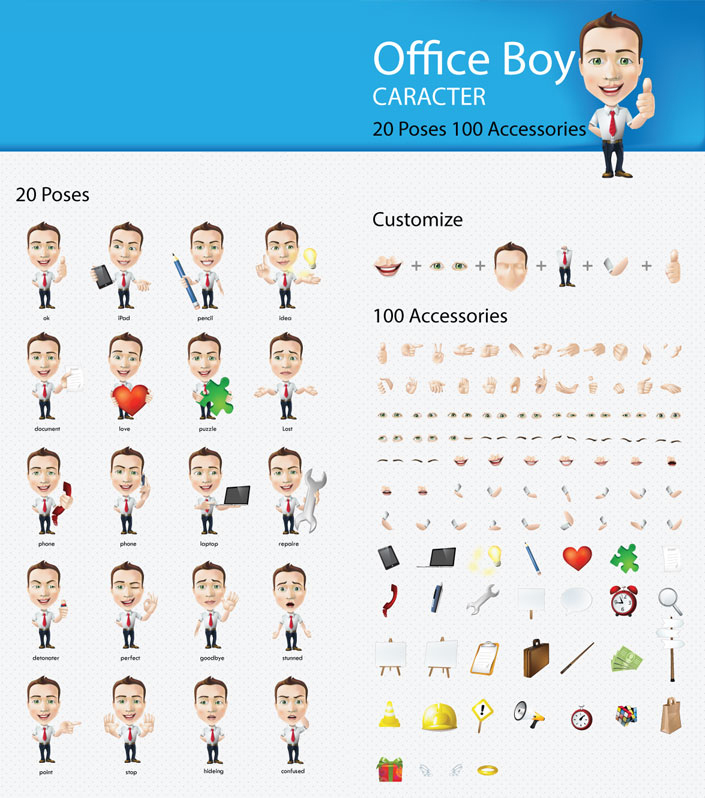 So you can put together the mascot that best represents you. A mascot is there to speak for you. Make sure it speaks the way you want it to. Web design freebies from Greedeals.com. Helping creative people stay out in front.